So Saturday night I had friends over for dinner, and I made a top sirloin roast from Chris Schlesinger's How to Cook Meat. The roast is rubbed with a mixture of coriander, paprika, toasted cumin seeds, black pepper and salt, which was a great blend. Good thing I like it; the recipe had me make about three times the amount of spice rub I could possibly apply to the meat. I'll try the leftovers on a steak. Then the roast is browned in a 500 degree oven for 1/2 hour, the heat is turned down, and you cook until done. This worked out well; the outside was nicely browned, the inside rare. The recipe calls for a savory marmalade to be served with the roast. You mix chopped plum tomatoes, thinly sliced limes and sugar and cook the mix for a few hours on low until very thick. Then you add some chopped chipolte pepper with a bit of the adobe sauce it comes in, as well as salt and lime juice. 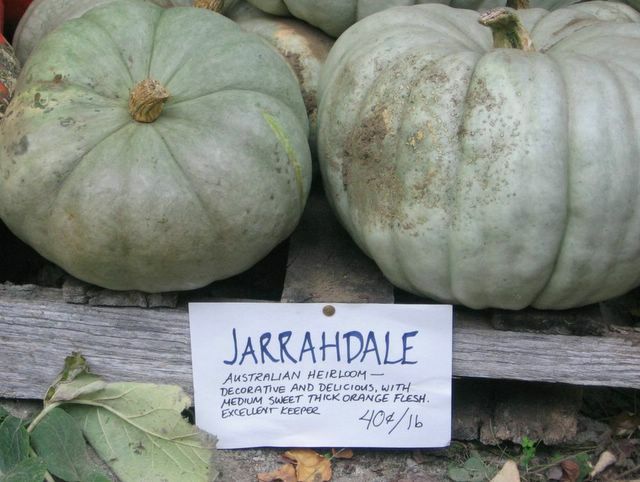 The results was spicy, tart and sweet, with deep undertones. I liked the brightness the finish of lime juice gave, and I liked the balance of fruitiness, smokiness, and spice, but I disliked the bitterness of the lime rind. It was just a little too strong. I wonder if lemon rind would be better. I might try it. What I'm really interested in is the possibility of canning the marmalade, but I'm not sure about that. I would think there would be enough sugar and acidity to allow for safe canning, but I don't know how to be sure. 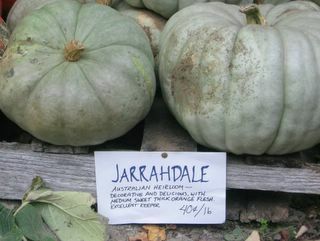 If my kitchen weren't already overflowing with vegetables, I would have bought one of these from a farmstand in Concord. Aren't they intriguing? I love a Pink Lady, which is a combination of 1 oz gin, 1 oz calvados, 1 oz lime or lemon juice (lemon is traditional, lime is better), and a little grenadine. It's crisp, with a similar balance between sweet and tart that you get in a good margarita, but more versatile. I wanted one the other night, but lacked, well, both apple brandy and lime juice. Undaunted, the boyfriend decided to make a pink lady with gin, regular brandy, and Granny Smith apple juice, freshly produced from a juicer. Since fresh green apple juice is sweeter than lime juice, he skipped the grenadine, which would have ruined the amazing color anyway. Note: the color did not turn brown as the drank sat, as I feared. Maybe it was the alcohol? Anyway, I've decided to call it a Lady Apple. Calvados could only make it better. I've been too busy to blog much the last few weeks, but as you may have seen, I've posted some pictures below. I wanted to give a quick explanation of the eggplant picture. The two orange spheres really are eggplant - they're Turkish eggplant, and I, an eggplant disliker, have decided I love Turkish eggplant. 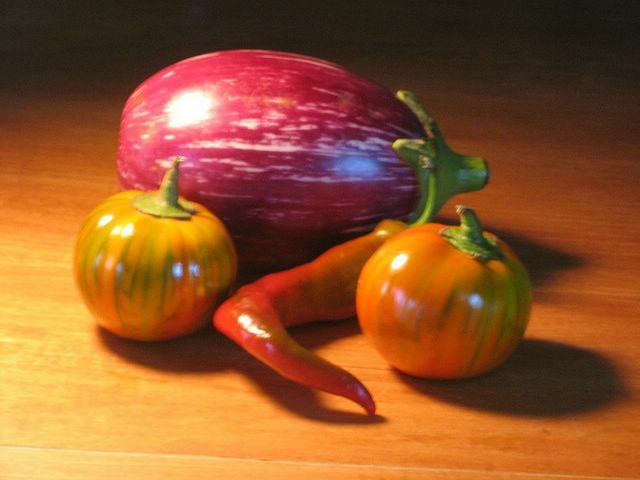 The texture is firmer than regular eggplant, more like a green tomato. I also think the color is gorgeous. I picked these up because, two weekends back, the Harvard Square farmers' market featured a chef improvising samples out of raw materials he was grabbing from the different vendors. He prepared the eggplant in a way I never would have thought of on my own. He didn't salt the eggplant; he just chopped it into large chunks. He cut hot peppers into small slivers. Then I believed he sauteed the peppers a bit, added the eggplant, then poured apple cider over it all and let it cook down until the eggplant was tender and the cider syrupy. He finished the dish with fresh mint. It was fantastic, with a relish-like sweet-tart piquancy, and a brightness from the mint. I replicted this at home as best I could without any mint; I added some dry mustard, black pepper, dried basil and celery seed. The effect was of course more relish-y and less complex than the fresh mint version, but it was still very good, and a brand-new way of approaching eggplant to boot. I used, as he did, a mix of lavender and Turkish eggplant, but I should have stuck with the Turkish. The lavender turns an unappealing shade of gray when cooked, but the Turkish orange remains vibrant. Cooking demostrations are a sign of a good market. A lot of people are very intimidated by unfamiliar fruits and especially vegetables, and a demo of a simple cooking technique can give them the courage to try something new. This is good for the farmer and the customer. I also like printed recipes, which the Massachusettts Farmers' Market association has been providing this year in the form of oversized cards with very handsome photos on the front. My friend who manages the Framingham market made sample lunchboxes for back to school, using bread, fruit and vegetables from the market, with only cream cheese and cheddar purchased out-of-market (they don't have a dairy person yet, unfortunately). I think that's a great idea, and I would love to see more of the markets doing that sort of thing. I hate to see people leaving a market that's full of interesting things carrying just tomatoes or just corn. 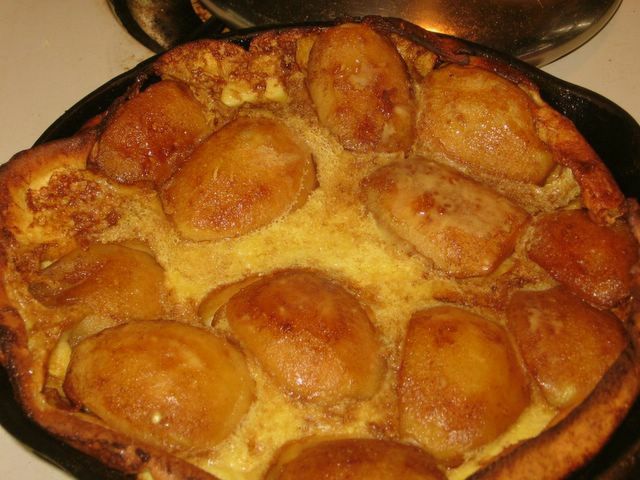 German apple pancake. Cause it's fall. No photo today, because nothing could make my lunch look good. It tasted great, though. Ever get caught out without any food in the house? I couldn't believe how empty my fridge was Sunday night. I had a touch of some sort of virus or other last week, so I missed my vegetable pickup. I had spent Saturday out at the Brimfield antique fair (got some great 1920s cookbooks), so I didn't have much in the way of leftovers. And I haven't done a proper pantry-stocking in months. So I had no bread, no cheese, no pasta, no meat, just one egg, no crackers, no peanut butter, no yogurt, no vegetables except potatoes. I had nothing. But I was determined to make myself lunch, because every time I buy lunch out I feel like I've lost at some sort of personal game. So I made: What-I've-Got-Salad. And it's pretty good. I mixed some boiled potatoes, a can of wood-smoked sardines in oil, the egg (boiled), some mayo, paprika, celery seed, pepper, mustard, a drop of Worcestershire, and salt. And, lo, it was tasty. The events of the last week-and-a-half have been so awful that the idea of posting anything about food has seemed, well, inappropriate. Instead, I've been crying, obsessively reading news blogs, cursing the Bush administration, rinsing, repeating. But I feel like I should post something, anyway, at least to explain what a peach rattafia is. 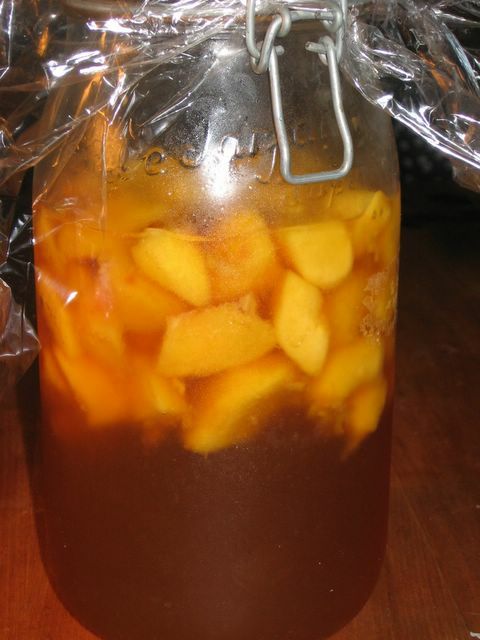 Peach rattafia is essentially peach cordial made with brandy. So what I've got going on in the picture below is a quart of brandy, 3 cups of chopped, peeled ripe farmers' market peaches, and 1 1/2 cups of sugar brought to a boil with 1/2 cup water. I like cocktails, and I especially like trying old cocktail recipes from my collection of old cookbooks. Peach brandy is called for fairly often, and Hiram Walker is disgusting. The only choice is to make it myself. This is my first attempt at flavored brandies, but I've made flavored vodkas (sugarless) before - apple, blueberry, caraway, dried cherry, and pink peppercorn. I didn't care much for the fruit flavors, although my vodka-loving friends liked them. (I'm more of a gin gal.) But the caraway and pink peppercorn vodkas were great, especially the latter. Don't let anyone tell you that pink peppercorns taste no different from black; they have a sweet edge that balances the peppery bite, and the full flavor came through amazingly well in vodka. If you try this, use good spices (Penzey's, for example), and taste the vodka every day until the flavor seems perfect to you. I found that about three or four days worked well for the peppercorn, just two for the caraway. In comparison, the instructions for the peach brandy (adapted from Helen Witty's excellent Fancy Pantry) suggest at least a month of steeping. The peaches should be amazing by then. I'm keeping the jar in my fridge, because the days are still pretty warm, and I had a bad experience once with a blueberry vodka. The problem with city apartments is the absolute lack of the "cool, dry place." But if you had such a place, you wouldn't need to refrigerate. I'll give the report back in a month or so. Peach ratafia in the making.